It has been all go at the Oriental Institute Library this May! The usual busy exam-time activity has been a real contrast after a relatively quiet April, and we hope that everyone is finding the Library a conducive area for studying and revision. As ever, if you do find that people are talking or otherwise disturbing you, do let the Library staff know and we will try to resolve the issue. Two exciting pieces of news for May: firstly, readers may not be aware, although we did put an announcement on the Facebook Page, that bottles of water are now allowed into the Library, in line with other libraries which have also relaxed their policies. We would ask that coffee/soft drinks NOT be taken in, and food is still strictly forbidden, but water is fine, as long as it is kept in a sealed bottle or flask and the lid kept tightly in place when not in use. Secondly, we have our beautiful display of items from the Love and Devotion Exhibition which are still available to buy. Please ask at the Library desk if you would like to purchase something lovely at a reduced price! Regular users will be aware by now that our door-entry system is currently undergoing a refurbishment. The sensors on the door to the library and the front door of the building are currently awaiting a part to make them work properly, but once they do all blue University of Oxford card holders will have automatic access to the Library during opening hours, so no more queues at the start of Michaelmas Term! (This is probably more exciting for us than for the readers, we realise…) We *will* still need to add people to the Circulation application for the Library, but this is a quick and painless process and can be done whenever someone wishes to borrow a book. Readers who also use the Chinese Studies Library will be aware by now that the CSL will be closed for a period over the Long Vacation while the collections are moved to the new Bodleian K.B. Chen China Centre Library at St Hugh’s College. During this transitional period, expected to last from the 4th July to the 4th August, CSL books which have been borrowed should be returned to OIL; we will arrange for them to be re-homed when the China Centre has opened again. Details can be found at the CSL website: http://www.bodleian.ox.ac.uk/csl and on the Library Guide: http://libguides.bodleian.ox.ac.uk/bodleian-csl. As this is still a bit of a way off I will post a reminder in our June Headlines post, just to make sure. This entry was posted in Merchandise, News, Re-organising the Library on 3 June 2014 by . New! “Love and Devotion” merchandise on sale in the Library! 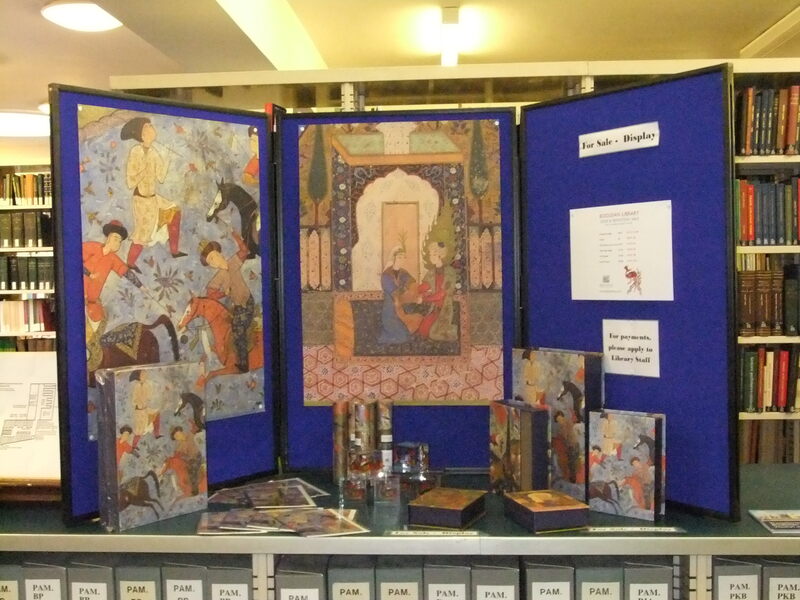 We have been asked by the Bodleian Shop to host a sale of the last of the merchandise from the “Love and Devotion: From Persia and Beyond” Exhibition, which ran between November 2012 and April 2013. The exhibition showcased stories of human and divine love told through the pages of Persian manuscripts dating from the 11th century onwards, often with beautiful illustrations, some of the most spectacular of which have been captured for the items which we have on sale. 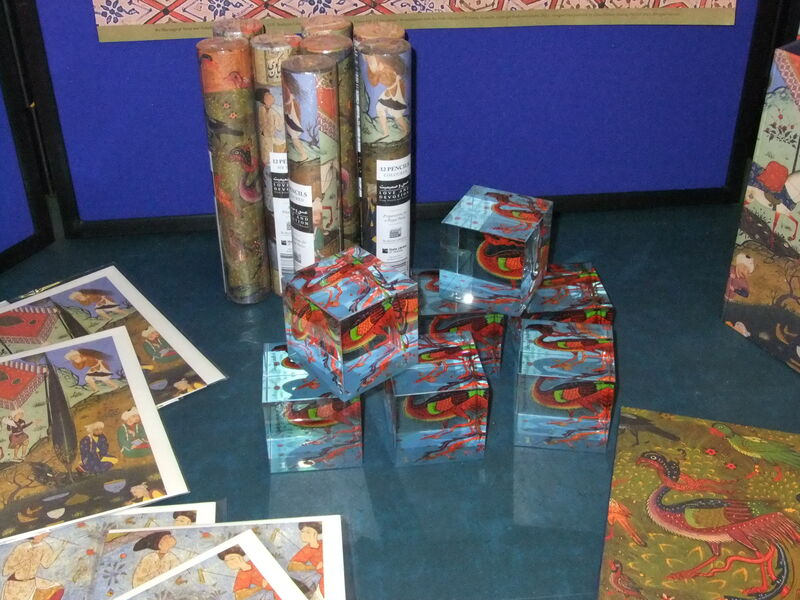 We have posters, notecards, pencils, boxes and paperweights, all at half price or less, and available while stocks last. There is a display just inside the Library; please ask a member of staff if you would like to purchase something. This entry was posted in Merchandise, News on 22 May 2014 by .